Colby Pearce, a 45-year-old former Olympian and highly decorated track and road cyclist, was injured in a fall on the velodrome in February 2017. The crash left him with a broken right clavicle and several fractured ribs. He visited the University of Colorado Sports Medicine and Performance Center in August and told specialists he felt lopsided, as though the right and left sides of his body were out of sync. 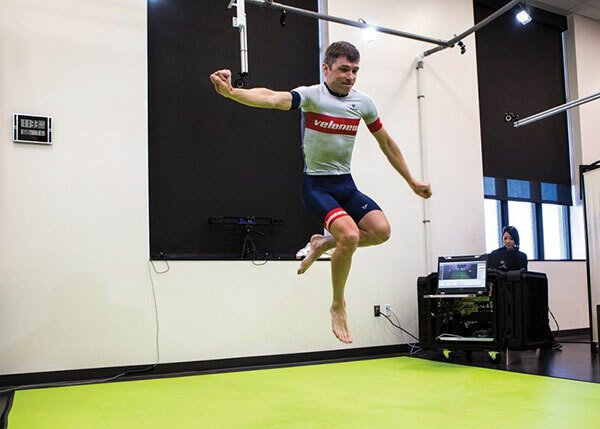 Pearce wished to analyze his muscle-firing patterns using the Center’s DARI Motion Health scanning technology, a highly precise, eight-camera, 3D motion-capture system that acquires a full-body musculoskeletal analysis. Using the DARI system, Elliott is able to objectively analyze how the body is moving and base her training decisions on quantitative data to minimize the risk of injury and track progress over time. The initial DARI scan revealed that Pearce’s right abdomen was still stiff from his injuries. The right side of his thoracic spine was inhibited during spinal rotation. He also displayed knee valgus (when the knee collapses as you squat) in his left leg, indicating a high risk of ligament injury. His right leg was unstable; he displayed high landing valgus (when the knee collapses upon landing after a jump). He also exhibited a large amount of external/internal rotation at the tibia/fibula of the right leg. Finally, he demonstrated significant amounts of pelvic rotation and obliquity (a common mal-alignment of the pelvic girdle). Working with Elliott, Pearce formulated three training goals: right side stabilization; an increase in the rate of force development (a measure of explosive strength, or simply how fast an athlete can develop force); and improvement in anti-rotational stability. To achieve these goals, Pearce began strength and conditioning training two times per week, with an emphasis on developing his glutes, hamstrings, and lower back muscles. He also focused on improving hip and knee stabilization through a variety of unilateral and multidirectional exercises, such as dumbbell presses, lunges, single-leg deadlifts, and single-leg stability ball curls. He improved anti-rotational stability by focusing on his core as a rigid conduit for power transfer. The exercises emphasized more pulling-based movements with the upper and lower body, and incorporated a balance of horizontal and vertical pulling and pressing, bilateral and unilateral movements, and movements in all three planes to become more mechanically sound, generally. Finally, Pearce increased his rate of force development through a combination of agility ladder drills, speed squats, plyometrics, and total body power exercises. Here, he emphasized less weight and focused on neuromuscular activation and proper body positions for optimal power production. A second DARI scan was conducted in October. Pearce’s overall score increased from 1617 to 1661. (This score indicates how the three components — strength, power, and dysfunction — work together, giving an athlete an overall idea of movement and injury risk.) His strength increased from 1059 to 1076. His dysfunction score (a measure of asymmetry) decreased from 154 to 85. His vulnerability score (indicating his injury risk) decreased from 60 to 57. In total, Pearce improved in multiple areas. His spinal mobility improved from 19.1 degrees of separation between the left thoracic and lumbar segments to 23.4. He also improved his single-leg squat depth, and he showed decreased amounts of femoral and tibial internal rotation on the left leg and external rotation on the right leg. “These changes lead to better power generation by decreasing the amounts of force dissipation through leaks in the kinetic chain,” Elliott said. Finally, both his lunge and jump kinetics improved markedly, demonstrating increased amounts of pelvic stability and range of motion, and improved rates of force development. In mid-October 2017, Pearce competed at the masters track world championships. He finished third in the scratch race, second in the points race, and took silver in the team pursuit. Originally published by Chris Case on VeloNews.